The evolution of online media has brought forth a new age of fandom online for sport enthusiasts with access to hundreds of new sports articles daily. 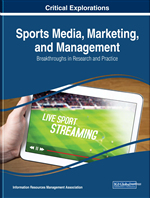 This chapter touches on the perceived credibility of the modern sports article and provides evidence from scholarly studies, including the author's own sports credibility study. The study examines how article source, medium, fan identification, and user comment tone can all impact the credibility of a sports article. Study participants were randomly assigned to read a sports article in 1 of 12 stimuli groups. The article source was indicated to have appeared on a mainstream sports website, a sports blog, a social networking site, or a wire service as well as with positive comments, negative comments, or without comments. Analysis revealed that fan identification level was an important factor in credibility ratings as highly identified fans found the article to be significantly more credible than low identification fans as a whole. The study implications and factors influencing the credibility of an online sports article are explored. Few aspects of American life compare to an old-fashioned sports rivalry. Nearly every fan has a favorite team, and every team has a bitter rival. Coaches and players spend all season preparing for this rivalry game they desperately want to win. For the players, it’s glory on the gridiron, the field, the rink, or the court, and a chance to establish themselves under the bright lights. For the fans, these games may mean even more. Crowds pack the parking lots hours before the game to tailgate with friends and support their team. Team logos are seen on clothing, windshields, and even license plates, and it clearly establishes what side a fan is rooting for. Fans can easily spot their enemy. The attitude between opposing fans can get contentious, and this all happens before the game even starts. From the opening kickoff to the final whistle, the crowd is raucous and loud as fans from both teams realize what is at stake in a rivalry. When the game is over, the fans from the winning team go home ecstatic with a year of bragging rights. This may seem like insanity, but to a sports fan, this is completely ordinary. Whether at a live game, in front of a television, or streaming from a cell phone, millions of fans around the world have felt the highs and lows of sport, which has turned sports media into a multi-billion dollar industry. American sports programming in 2014-15 generated $8.47 billion in sales for ABC, CBS, NBC and Fox, accounting for more than one-third (37%) of those companies’ overall ad revenue for that period (Crupi, 2015). In 2014, Chevrolet, AT&T, Geico, Verizon, and Budweiser each invested over $250 million in advertising during live sporting events (Crupi, 2015). While digital video recorders (DVRs) have seemingly diminished the value of television ad marketing, sports continues to guarantee a reach of millions of live viewers for hundreds of games a year. Live sports media is also no longer relegated to just television screens. For the first time ever, the National Football League broadcast a regular-season game exclusively on the Internet: October 2015 marked the first time in which audiences around the country needed a computer or mobile device to watch an NFL game (Dougherty, 2015). Sport has become a staple of American society as millions of fans are influenced by sport every day, and more individuals are becoming interested and active in sports (Wann, Melnick, Russell, & Pease, 2001). Sports and exercise have even come to carry cultural meanings that reflect the ideologies of our wider society and have been recognized as common elements of civic engagement (Beyer & Hannah, 2000). Robbins (2004) argued that in recreational sports (such as those with friends), all players are aware of the basic rules—and the repercussions of violating those rules—and take on roles as self-officiation. Players must create order “by creating a moral code of conduct or an ethos—the spirit of the game” (p. 315). An ethos, or spirit of a culture, is a meaningful system of morals, customs, norms, or practices of a group or society, which can often influence other norms or customs (Geertz, 1973; Robbins, 2004). The inherent competition that exists within sports has also been described by scholars as the ultimate struggle of good and evil, where “winning is a sign of goodness, rightness and divine approval” (Beyer & Hannah, 2000, p. 110). The ethos of sport is not only manifested in the athletes themselves but also by their fans. Sport fandom is associated with an individual’s affinity for specific sports teams. Many fans feel connected to a sports team in ways that go beyond the games themselves and carry over into a person’s daily life. Some fans are so engulfed by their relationship to a team’s successes and failures that it becomes a part of their social identity (Hu & Tang, 2010). Tajfel’s (1981) social identity theory asserted that maintaining memberships in significant social networks would enhance a person’s social identity, which in turn results in a more positive self-concept. These significant group memberships and relationships are used in social comparisons to develop and maintain one’s self-esteem. The individuals within the group typically develop a system of social norms and values, which regulate their opinions and actions (Turner, 1982). In the sports realm, fan identity is the personal commitment or emotional involvement a person has with a sports organization (Milne & McDonald, 1999).